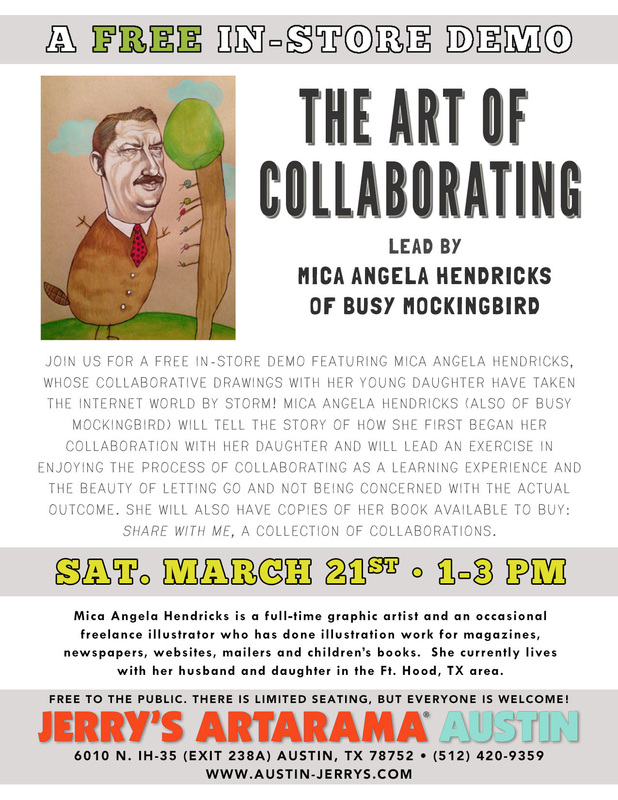 This weekend, the Kid and I are going to be at our favorite Austin art store to talk about our collaborations, and have a little fun! So that’s where we’ll be! I’ll talk a bit about the fun of collaborating, how Myla and I work, and even have some in-class demos for everyone to play with. It’s gonna be fun! This sounds great! Granddaughter and I plan to attend. We would love to have been able to attend – sounds very inspiring. Alas, living a long ways away from you (in British Columbia, Canada) means we can’t. You have inspired me, however, to do a future posting about the collaboration between our great-granddaughter and me for the illustrations in our newly-published children’s chapter book, Jake, Little Jimmy and Big Louie. Thanks and best wishes for your in-store demo. YIKES! I am going to be in Austin this weekend! I will definitely try and make this! Really enjoyed your demo saturday! So glad I happened to be in Austin for it!